KAPAS ISLAND RESORT - BEST KEPT SECRET IN TRENGGANU - NOW REFURBISHED AND RE-OPENED. 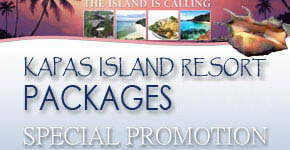 TAKE ADVANTAGE OF OUR PROMOTIONAL PACKAGES ! Kapas Island Resort is located on Kapas Island off Terengganu State, East Coast of Peninsular Malaysia. The jetty to the island is 15 minutes drive from Kuala Terengganu town and 30 minutes drive from Kuala Terengganu Airport. The boat ride from Marang Jetty to Kapas Island Jetty takes approximately 10 minutes by a sheltered speed boat. Marang Jetty provides ample secured parking lots. If one chooses to drive, it will take approximately 5 hours non stop driving from Kuala Lumpur city to Marang Jetty. The resort is only few minutes walking distance from main jetty on the island. Just in front of the resort lies a white and long sandy beach, which is a short walking distance from the chalets. The resort facilities include 60 units of Malay built traditional designed wooden chalets, two dormitories, a swimming pool, 3 covered multi – purpose hall, one open air hall, a karaoke room, a seaside open – air restaurant and a surau. An outdoor (volley ball, beach football and jungle trekking) and an indoor games (carom, chess, congkak, mahjung, card etc) as well as marine activities (snorkeling, fishing, squid catching etc) is available at the resort recreation centre. Arrangement for a scuba – diving and kayaking is also available. The resort could cater up to 250 guests at one time. The resort is operated and managed by a private owned Bumiputra company, licensed under the Ministry of Finance and Ministry of Tourism, Malaysia. Pulau Kapas is an ideal island paradise with white sandy beaches fringed with shady palm trees making it a perfect retreat. The first impression is its laid back yet rustic ambience calling for pure relaxation. It offers a "home away from home" amidst a typical Malay village concept and hospitality. Pulau Kapas offers a variety of adventures to sun and sea lovers. The hidden treats of nature's splendors are both on land and below the sea. You could track into the island's interior and amazed at the colorful natural flora and fauna along the way. Explore the most varied marine life among the many coral reefs around the island. Snorkeling and underwater diving is popular along stretches of shallow coral reefs of the island's western shore. The island is just 4 nautical miles from Marang making it highly accessible from the mainland. The advantages of Pulau Kapas is its easy accessibility, wide range of activities and facilities. It is highly popular among backpackers as it is less expensive than other neighbouring islands yet offers equally good beaches. July, August and the local holidays are the best times to go. An island famous for its clear waters, sandy white beaches and swaying palms, it is relatively isolated. Home to an infinite variety of hard and soft corals, the waters around the island abound with sea-shells, fish and turtles. Tucked within breezy coconut groves, traditional huts adorn selected stretches of the spotless beach.The island's laid back atmosphere is ideal for relaxation but the more adventurous will find it is also a haven for swimming, snorkeling, windsurfing, kayaking, boating and fishing. Kapas Island is famous for squid catching activities whereby tourist flock to the island from the month of April to September every year for this unique activity. Guest will go squid catching at night time by a local fisherman boat, equipped with the squid catching equipment to catch a squid as big as 20 inches long. The squid caught will be up to the guest for own barbeque and to be cook at the resort restaurant at a minimal charge. The island is also a host for an annual International event ‘Swimathon Event”, which is held during the month of April every year. The event requires a participant to swim across the ocean from Kapas Island to the mainland which is approximately 6.5 kilometers in distance. This event has been attracting more than 200 participants yearly from all over the world. Services such as snorkelling around the island is very much standardised and priced accordingly. The standard price of equipment is RM5 per day for mask & tuba and RM5 per day for fins. A taxi from Kuala Terengganu airport or the bus terminal costs RM 30.00 per cab for the journey to Marang Jetty. Boat transfer service may start as early as 7:00 and costs RM 35.00 per person (two way). The key attraction for diving at Pulau Kapas is the World WarII shipwreck located 5 nautical miles offshore. The outer reefs on her seaward side has are good diving spots as well. Its shallow water make it an ideal training ground for divers. Besides staying on the island, one may choose to stay at better facilities available in town and may do the diving on day trips. Leisurely splashing and snorkelling around with a playful but shy variety of fishes are pleasant and undemanding pursuits. Play spot the turtles and pay your silent underwater tribute to the colours of the sea shells besides wind-surfing, kayaking and boating. Previously a well-guarded secret amongst members of the diving community, Kapas has now become more accessible to divers and snorkellers with services offered by Kapas Island Resort. Where else would be better than Kapas Island Resort to hold your organisation's seminar/ conferences where facilities and services are designed to ensure organisers and delegates are well taken care of.